After coming up short in his third shot at the Ultimate Fighting Championship light heavyweight belt, Alexander Gustafsson may consider a change of scenery. If Dana White gets his way, Max Holloway’s days as the world’s top featherweight could be numbered. Luis Pena has decided to change things up after suffering his first professional loss over the weekend. 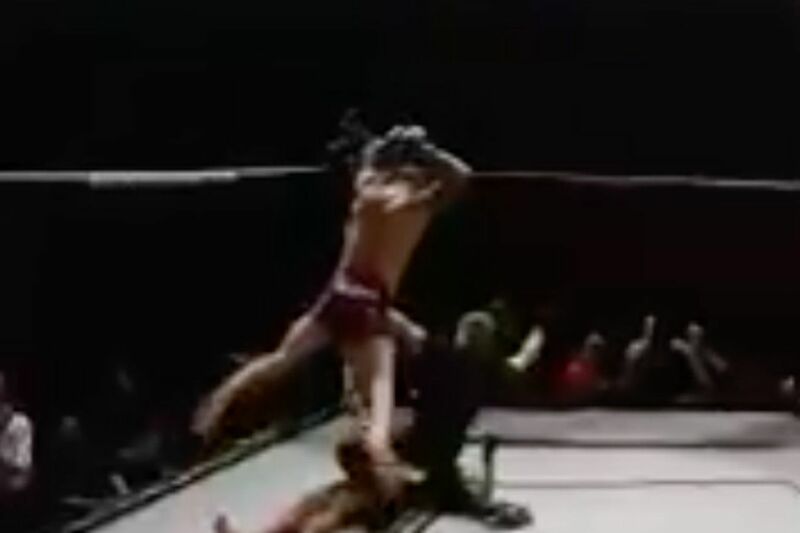 This move may have cost Austin Batra an amateur title, but the highlight will live on forever. Well, that’s one way to lose a fight. Amateur welterweight Austin Batra had the 170 pound Battlefield Fight League belt in the bag following a KO blow to his opponent Perry Hayer in a fight that went down in Coquitlam, BC. Unfortunately for Batra, he couldn’t help but attempt an unusual finishing maneuver moments after the ref clearly stepped in to stop the fight. MMA Fighting dubbed this a flying double axe handle strike, and we’ll take their word for it because it does indeed look like Batra is about to put an axe through his opponent while flying through the air. The move, clearly begun after the referee called an end to the fight, may have cost Batra the win and the BFL title, but now he can lay claim to a Crazy Mofo title. Batra moves to 4-2 as an amateur. 170 pound champ Perry Hayer is now 6-7. One of the most feared strikers in the Ultimate Fighting Championship lightweight division, Edson Barboza, has officially swapped the “Garden State” for the “Sunshine State,” announcing this week that he is relocating his family to Florida and his training to American Top Team. Dana White Still Believes Yoel Romero Should Move to 205, But, Should UFC Look at Third Fight With Robert Whittaker? If following last night’s headliner at UFC 225 between Robert Whittaker and Yoel Romero, you believe a third fight is in order, well, it looks like that might not happen. If you watched the contest, then you know it was one of the best middleweight bouts in recent memory. Whittaker outscored Romero in the opening two rounds, but in round three, the latter decked the champ before he recovered and returned fire. Round four was competitive, but round five was pretty much a blow out for Romero, who dropped Whittaker again and appeared to be on the verge of finishing the fight. In fact, many folks have opined that the round should have been scored a 10 – 8 for Romero (via the new scoring rules). None of the judges, however, did so. Whittaker walked away from the bout with a controversial, split decision win. Well, as you know, even if Romero had been handed the decision, he wouldn’t have been given the belt, since he came in at 185.2 for the fight. It was a repeat from what went down in February, when Romero didn’t secure the interim title after knocking out Luke Rockhold, because he missed weight for that fight as well. After the card, White was asked if he still believes Romero should move to 205. Prior to the card, the UFC President had said he thinks that’s what the Cuban wrestler should do. White stood by that belief at the post-fight presser. But is this really the route the UFC should go? Should they pass on Whittaker – Romero 3? Considering how last night’s bout unfolded? Yes, Romero missed weight, and he looked horrible after making his second attempt. But, the fighter has insisted his cut was stopped prematurely by the commission. Of course, health concerns need to be monitored here, but has the UFC thoroughly vetted what happened ? To conclude the book should be closed on Romero’s run at 185? So, depending on what issue Gastelum is dealing with, perhaps, the former welterweight contender could be a possibility in the not too distant future. But, would that fight draw more views that Whittaker – Romero III? That’s a good question. At the end of the day, as the news cycle moves on, and Whittaker takes times to recover from a broken hand, calls for a third bout with Romero will have likely diminished. It’s just really unfortunate that Romero missed weight again, as, in a vacuum, a third scrap between the two sounds about right. The post Dana White Still Believes Yoel Romero Should Move to 205, But, Should UFC Look at Third Fight With Robert Whittaker? appeared first on Caged Insider.